We have been growing gooseberries for many years now. As a child they were not my most favourite fruit but since we have grown our own I have come to like them much more. i know some people are put off them by their flavour, they aren’t always the sweetest of fruit, and the majority of plants are very spiny. Over the last few years I have changed the way that we grow them. I used to let them grow as a bush but that meant getting cut to pieces when picking them. We have also been plagued by sawfly larvae for the last few years, one year practically all the leaves were stripped off the plant whilst we were away. 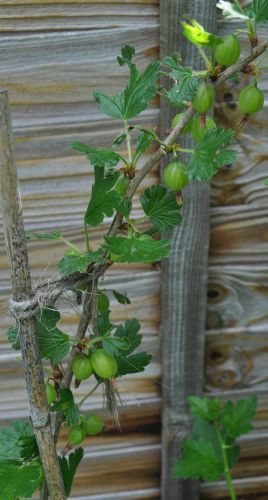 To make life easier for myself in picking and sawfly larvae management I have been growing the gooseberries as cordons. The idea here is to grow branches vertically and apart from each other like the fingers on a hand pointing upwards. 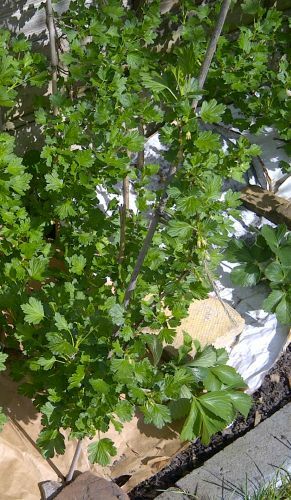 By trimming all side shoots to a few leaves you get green fingers pointing upwards with lots of space between allowing you to pick gooseberries or sawfly off the plant without scratching.This also allows more daylight into the plant. Sawfly over-winter as a cocoon in the soil with the adults emerging about April.They lay torpedo-shaped eggs along the main veins on the undersides of leaves usually low in the middle of the bush. These hatch and the larvae remain in the centre of the bush feeding for 1-2 weeks until about half grown, they then move through the rest of the bush stripping the leaves. After about 3 weeks of feeding the larvae drop to the soil and form cocoons. There can be 3-4 generations in a year between late April and September. The sawfly in this picture has stripped half the leaf. I understand that this is a female, the males have more black marks on them. I have observed that males can often be found in groups on a leaf whereas the females tend to be on their own. 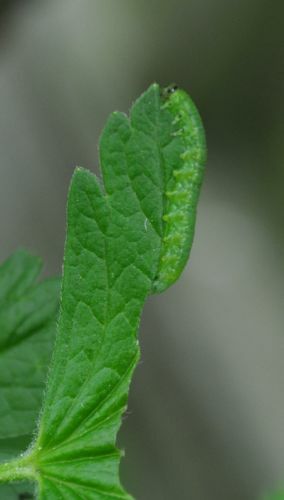 manual removal of sawfly larvae – I usually visit my bushes twice a day and look for sawfly larvae damage picking off the larvae and squashing them. This has reasonable success in reducing the numbers. Spotting and squashing larvae on the outer leaves is fairly easy but by that time a lot of damage has been done at the centre of the bush, that is why growing as cordons to allow easy access to the base / centre to remove eggs or small larvae is so advantageous. mulch / barrier – this year (2013) I have put a layer of thick paper from bird seed sacks over the ground under the cordons. This won’t prevent the fly from emerging from the soil as it will probably find the edge but it does mean that any larvae that fall or are knocked from the bush don’t fall into the soil hopefully giving our local birds a chance to eat them. Since babies were supposedly found under gooseberry bushes I rather like this use – “as a learning aid, to avoid explaining the facts of life to your children”! we only have one variety which is Invicta, a vigorous, prickly, very hardy plant which produces pale green fruit that is mildew resistant. This variety is best used for cooking.